EU migrants and benefits: how does the UK compare to other member states? Klára Fóti has analysed the impact of freedom of movement on the public services of different member states in a Eurofound report, Social dimension of intra-EU mobility: impact on public services. This post consists of extracts from that report. The first examines the right to equal access to public services and benefits enjoyed by EU migrants – a key aspect of the UK’s renegotiation – and the ways in which different countries interpret it. 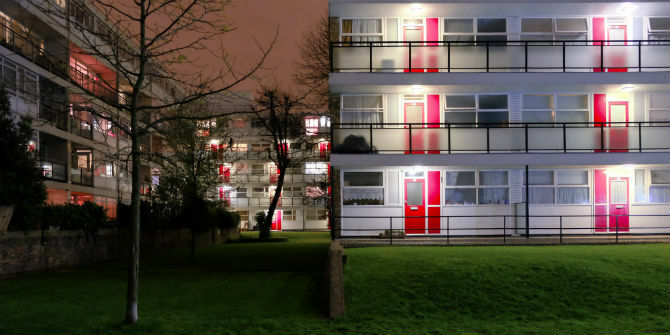 A further extract looks at the take-up of benefits and social housing among EU migrants. Non-discrimination in the treatment of EU mobile citizens in any EU Member State is closely linked to EU citizenship and is, therefore, a core element of recent EU treaties. The aim of the EU rules on free movement and access to social assistance and social security is, as laid out in Directive 2004/38/EC on free movement of EU citizens, to ‘facilitate the effective exercise of the right to free movement and protect those who genuinely make use of it’. At the same time, the rules must contain ‘robust safeguards to ensure that the rights afforded to EU citizens are not abused’ and ensure that ‘unreasonable burdens are not placed on the social assistance schemes of the host Member States’ (European Commission, 2013a, p. 13). But this means that the Member States have to provide their services to all those EU mobile citizens living in their country. Indeed, as another article concludes, ‘a society can no longer limit its solidarity to its nationals and should include all persons who demonstrate a sufficient degree of integration in that society’ (Minderhoud, 2014, p. 224). At the same time, the Court of Justice has so far not allowed unconditional access to social assistance benefits by EU citizens. Conditions include legal residence and a genuine link with the host country’s labour market. What are the criteria, therefore, for residence status? Ireland and the UK use a ‘habitual residence test’ to decide this. In other host countries, similar criteria and concepts exist; for example, in Austria, the country of residence for new immigrants is defined as ‘where the person has his/her new centre of life’, and in Sweden the term ‘true life and home’ is applied. The right to reside is also an important question if the situation of a job-seeker is considered. Although workers can move freely within the EU, Member States are allowed to limit their right to reside to six months. The term ‘unreasonable burden’ concerns the right of residence for economically inactive EU mobile citizens such as pensioners, the long-term unemployed, tourists and students. The time limit on their free movement and residence is three months. Beyond this period, they have to prove they have ‘sufficient resources’ so that their presence (involving the claiming of any kind of benefit or the use of services) does not become a ‘burden on the social assistance system of the host Member State’ (Article 7(1) Directive 2004/38/EC on free movement). It has to be noted, however, that the proportion of the non-active EU mobile citizens is very low, at between 0.7% and 1.0% of the overall EU population. In addition, the majority of these (64%) have worked before in their current country of residence. As regards the job-seekers among them, a third were employed one year before (ICF GHK and Milieu, 2013). Although the country studies in this research have not focused on the details of applying EU law, the many changes in national rules presented [see pp31-25 of the full report for these tables] reflect not only the consequences of the crisis, but also some uncertainty the Members States and local authorities had to face when applying the rules. It is evident that, in addition to the enlargement rounds of 2004 and 2007 and the inflow of citizens from the EU10 countries, the crisis has had a profound effect on legislation and rules for the welfare systems of the individual host countries examined. In terms of family-related benefits, the take-up by EU10 citizens of child benefit schemes in the Netherlands is low (0.4%). It has to be noted, however, that this could increase as EU10 citizens who stay in the country begin to have families. At the moment, there are around 12,000 children under the age of 18 from EU10 countries living in the Netherlands. In Italy, the take-up of family assistance benefits by EU10 citizens is 35%, slightly higher than that of Italians (30%). In Denmark, in 2007, out of the three most prevalent nationalities, only the Lithuanians’ recipient rate of maternity or paternity benefit was higher than that of Danes, whereas by 2013 the rate for Poles and Romanians also exceeded the rate for natives. Trends in the take-up of child benefit in the country also show an increase. Data show that this is linked to the increased inflow of citizens from eastern European Member States. According to the think-tank Kraka (2013), since 2007, the number of EU8 citizens receiving child subsidy has more than doubled. In Sweden, in 2010, both natives and EU15 mobile citizens had a higher take-up of parental allowance (18.1% and 12.8%, respectively) than citizens from the EU10 (10.1%), with the recipient rate of EU2 citizens even lower at 7.6%. The UK seems to be a special case in this regard. Child benefit is one of those (rare) benefits where the take-up by EU10 citizens (28%) is higher than that of UK nationals (18%), because they are younger and have younger children. 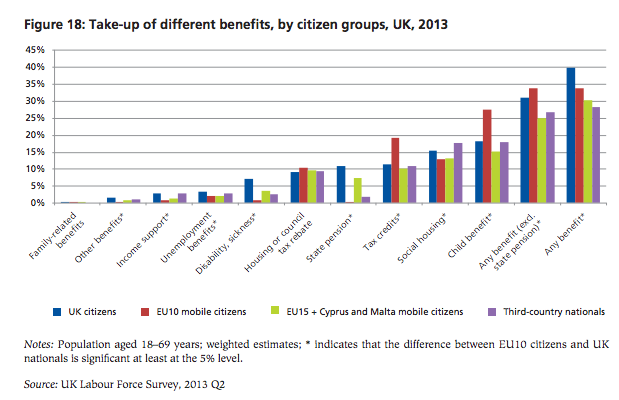 The importance of child-related benefits among EU10 citizens seems to be confirmed also by their higher take-up of tax credit (19%, compared with 12% for UK nationals). 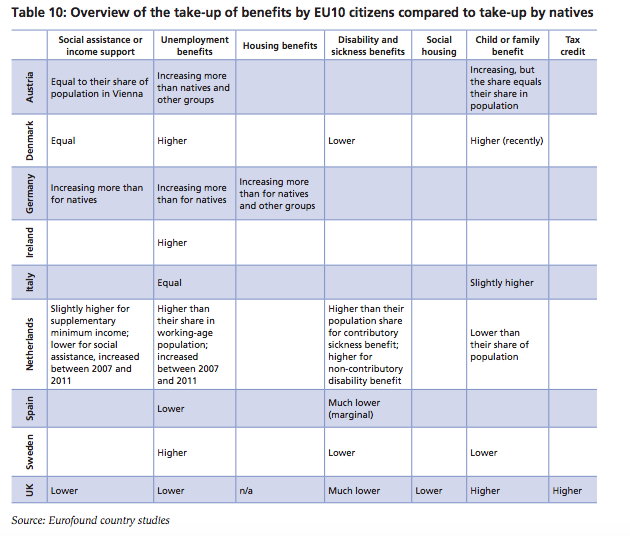 Considering some EU10 nationalities individually, in 2010–2013, Latvians, Lithuanians, Poles and Slovakians all had a significantly higher take-up rate of child benefit than UK nationals. At the same time, the take-up rate of child benefit by Romanians was lower since they might not have formed families as yet. In Austria, although the take-up of family benefits by EU10 citizens has been increasing recently, the share of this group in receipt of the benefit in 2013 equalled that of Austrian nationals, at 2%. Children with Hungarian, Polish, Romanian and Slovakian citizenship made up the biggest subgroups within the EU10 group, with the largest increases in 2013 observed for Bulgaria, Hungary and Romania. As has been noted in this report, the data do not allow one to make a direct cross-country comparison regarding the take-up of benefits. Based on information and data provided by the country reports), it is possible, however, to give a brief overview comparing the take-up by EU10 nationals and natives in each country. • 29% lived either with family or friends or rented a room in the private sector. Non-registration with the local municipal authority leads to similar problems as mentioned with education: non-registered EU mobile citizens are not entitled to social housing. Our social housing policy is primarily based on the level of need, amongst other things, and the communities which we find are most in need are not usually from eastern Europe. However, the public perception is often different; because we don’t have enough social housing to meet demand, they [eastern European migrants] become an easy target to blame. In Austria, waiting time for social housing (Gemeindewohnungen) is about two years. In Vienna, an agency specialising in social housing, called Wiener Wohnen, manages about 250,000 low-rent apartments. From 2004, the municipality has also subsidised cheap flats for people with incomes below a certain threshold. Social housing is a widespread service in the capital, with one out of four people using it. Currently, people from EU10 countries amount to 5% of all people in social housing, compared with 25% of third-country nationals. In Spain, the situation is similar: 68.5% of the EU10 population live in rented homes, whereas this share for nationals is 8.2%. Some 39.8% of Spanish nationals own their home without a mortgage, compared with 2.1% of EU10 citizens. EU15 mobile citizens are also in a much better position than those from the EU10, having more home ownership and renting less. Blauberger, M. and Schmidt, S. K. (2014), ‘Welfare migration? 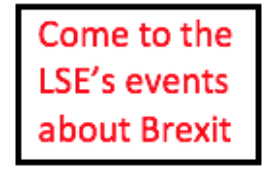 Free movement of EU citizens and access to social benefits’, Research and Politics, December. European Commission (2013a), Free movement of EU citizens and their families: Five actions to make a difference, COM(2013) 837 final, Brussels. European Commission (2013b), Free movement: Vice-President Reding’s intervention at the December Justice and Home Affairs Council, speech, Brussels, 5 December. ICF GHK and Milieu (2013), A fact finding analysis on the impact on the Member States’ social security systems of the entitlements of non-active intra-EU migrants to special non-contributory cash benefits and healthcare granted on the basis of residence, Directorate-General for Employment, Social Affairs and Inclusion, Brussels. INE (Instituto Nacional de Estadística) (2012), Encuesta a las personas sin hogar, Notas de prensa. Kraka (2013), Udbetalte børnepenge til statsborgere fra andre EU/EØS-lande, Kraka, Copenhagen. Minderhoud, P. (2014), ‘Directive 2004/38 and access to social assistance benefits’, in Guild, E., Gortázar Rotaeche, C. J. and Kostakopoulu, D., The reconceptualization of European citizenship, Brill Nijhoff, Leiden. Rutter, J. and Latorre, M. (2009), Social housing allocation and immigrant communities, Equality and Human Rights Commission, Manchester. Full report citation: Eurofound (2015), Social dimension of intra-EU mobility: Impact on public services, Publications Office of the European Union, Luxembourg. Klára Fóti is Research Manager at Eurofound. She talks about the report’s findings in this video. 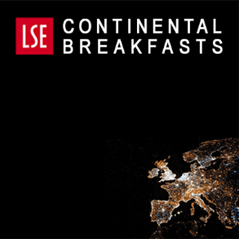 Is unrestricted labour immigration compatible with an inclusive welfare state? Reading the small print: will Cameron’s EU migration reforms pass legal muster?